But what was before? We present numbers of examples of the printed ads belonging to early 20th century, all including abusive content regardless the product/service advertised. Below you’ll find the highly sexist ads, emphasizing that men are superior to women in different situations. Before moving forward, please note that I'm not black and I do smoke, so there is nothing personal in my comments. The poster below is an ad of Van Heusen, a brand specializing in suits, shirts, trousers and ties for men for decades. The ad explicitly shows that it's a man's world, showing a woman on her knees serving a man coffee. Surprisingly, the extract from Van Heusen website today reads: "The Van Heusen brand is now also importantly linked to the international human rights movement via our USA licencor and all factories manufacturing any of our products must comply to a strict code of audited conditions. These encompass among other issues, minimum wages, hours of work, freedom of association, non-discrimination, no forced or child labor, health and safety standards plus environmental conditions." 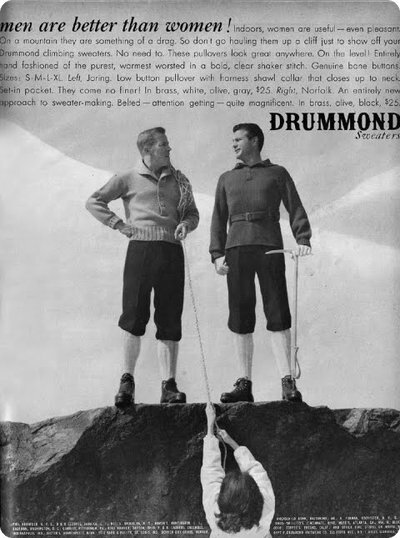 It proves the fact that the old-styled but deep-rooted stereotypes do change... But the question is do they change entirely, or is it just a disguise, outward position of the companies trying to gain faultless reputation? Looking at these ads, I have a feeling that women have come a long way to get where they are today! We can argue that the world has become a much worse place since sexual liberalism. When men ruled the world, things worked- but does that acquit the opinion that men and women are not equal? No it doesn't. Anyway, it's interesting to see how the opinion has changed and made these ads impossible today - thanks for that. There are hundreds of more sexist ad examples, but in my humble opinion, these two do speak for others two. Let's move on and see some more abusive ads of 20th century.. 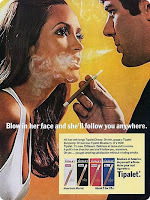 The ad in this paper is on Tipalet; a flavored cigarette from the 70's that “only the best men” smoke. There shouldn't be much debate on this one: despite promoting unhealthy way of life, these ad contains sexist elements as well. It says "Blow in her face and she'll follow you anywhere." But I doubt that blowing poison in someone's face will arise sympathies in anyone... One more notable thing is how the ad convinces the male customers to hit women with their cherry, grape or blueberry flavored cigarettes and how wild it is! One thing is explicit: it actually is WILD (but in a negative form)! 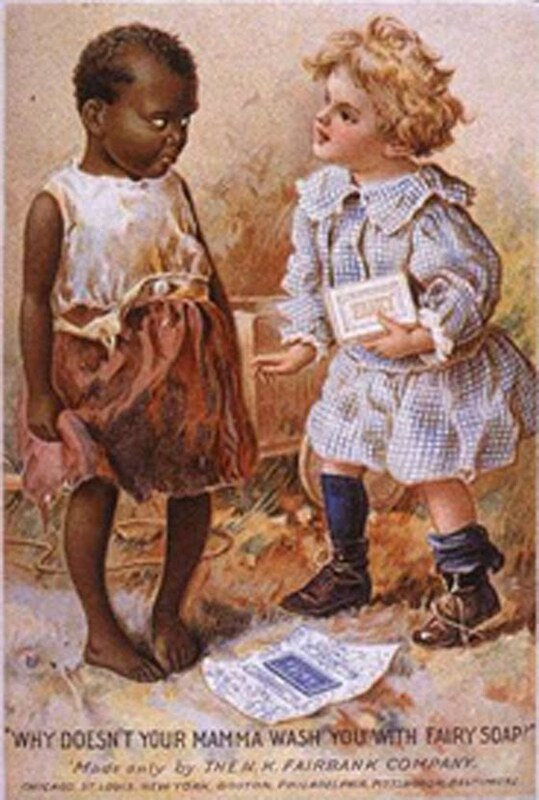 Advertisements played off of racial physical distortions in their campaigns. Focused on blacks, these ad makes fun of African Americans' physique in a way that enforces cliches. Slaves working in the fields were at risk for dehydration since it was intense labor and it's hot in the south. Nobody was passing out water bottles at the time, and as the name suggests -watermelon, having a high water content, appeared to be perfect for those people. 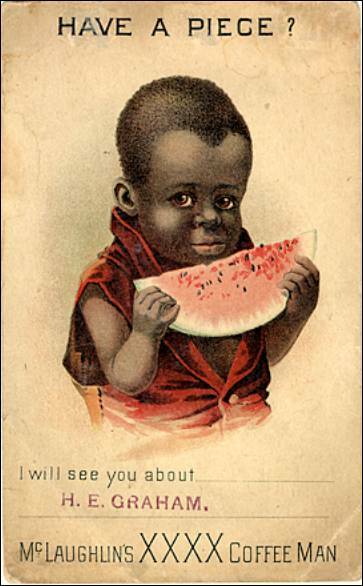 Despite this, at the time watermelon was typically cheap, nutrient poor, convenient and easy to grow…Resembling one more extremely stupid illusion of their lips and large skull, this ad definitely is very abusive, making fun of hungry African American kid.